immediate lesson feedback such as, "You did it!" or "Oops! Try again!" no pressure to complete a certain amount of "work" each day. A preschooler needs a lot of hands-on activity and shouldn't be spending longer than about half an hour at a time on his or her lessons. They also need a lot of repetition. Even if they appear to have already learned something, they will forget if it isn't practiced frequently. There are a lot of ways to do this. Here is how I managed the preschool program with my son. Each week, we started a new theme. Let's use "Zoo" as an example. On Monday, I would find a coloring page online about the week's theme. He colored it, we talked about it (What is a zoo? Have we ever been to a zoo? What are some of the animals you might find in a zoo? ), and then we posted the coloring page on the fridge and he completed the first online activity under that theme. This is usually a story or video, so it's a good introduction. The rest of the week, he was able to do any of the activities within that theme that he wanted to do. I encouraged him to do the ones he especially liked as many times as he wanted, but he wasn't allowed online longer than thirty minutes. We did other things throughout the week to support the theme. I had a box where I would put toys relating to the theme each week. For "Zoo", we gathered all of his toy animals together. We would count them, talk about the letter their names began with, discuss how the zebra and tiger had stripes, sort them according to color or size, put the lion BESIDE the giraffe and then ABOVE the giraffe and so forth. We would visit the library and check out books or videos on the week's theme. Sometimes we took a field trip (to the zoo, the playground, or the grocery store). We bought four varieties of apples and had a taste test during the "Fruit" theme! "Art" was making something out of clay (a banana out of yellow clay for the "Fruit" theme), or painting, or sometimes a cute idea I found online. It was very informal. It's also important for preschoolers to have a lot of free play time, and time to "help" you around the house. Think of a typical preschool classroom. There are always creative play toys: toy kitchens, dress-up clothing, dolls, and cars. I did like the reports, but I also kept a file folder for each theme and put his best artwork, photos of our field trips, and coloring pages in them. I hope this helps inspire you to use the preschool program as a jumping-off place for a great preschool experience! It was the perfect program for us. 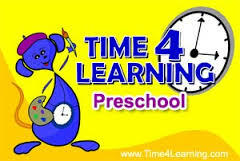 Discuss Time4Learning preschool in our Preschool Parents Forum!